Essays on the themes of healing, peace, and reconciliation. - Publisher This book will be one similar in format to Transforming the Ordinary. It will include fourteen essays focused on the themes of healing, peace, and reconciliation--timely topics in today's world. Each essay will close with questions for reflection and a brief prayer. Westerhoff's husband, John Westerhoff, has written an introduction to the book. - Publisher Written with grace and sensitivity, this collection includes 14 essays that focus on the themes of healing, peace, and reconciliation--topics as timely today as they have ever been. 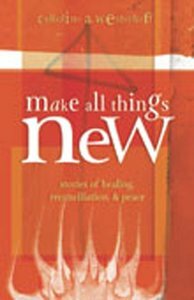 About "Make All Things New"
This book will be one similar in format to Transforming the Ordinary. It will include fourteen essays focused on the themes of healing, peace, and reconciliation--timely topics in today's world. Each essay will close with questions for reflection and a brief prayer. Westerhoff's husband, John Westerhoff, has written an introduction to the book. Written with grace and sensitivity, this collection includes 14 essays that focus on the themes of healing, peace, and reconciliation--topics as timely today as they have ever been. Westerhoff is the canon for congregational life and ministry in the Episcopal Diocese of Atlanta and formerly a senior consultant with the Alban Institute. 1. Crossroads; 2. Only One Thing; 3. Tears In A Bottle; 4. Shadow People; 5. Bridges; 6. Mother Mary; 7. Yes; 8. Out Of The Valley; 9. The Good Shepherd; 10. Pentimento; 11. Apocalypse; 12. Things Made New; 13. Sacred Wells; 14. Center Of The World.